An example of what one of the new CCTV cameras in Lancaster and Morecambe may look like. My name is Mal Neill and I run the Poppy Appeal for the Morecambe and Heysham district. Even though the appeal is in November, it takes all this time for the British Legion to finalise all the counting of monies raised. I have now been given the district final total and for the first time ever we raised over the £30,000 mark with a total if £30,083.12. I wanted to comment on the issue of more security cameras in Morecambe, that there are plans for more security cameras in and I must say I’m all for it and, believe me, I never thought I’d say that. I.m sure there will be cries of big brother but if it catches people vandalising public or private property, or being too lazy to pick up after their dogs or dropping litter then it’s a good thing. If we lived in a country where people naturally considered others and the impact of their behaviour, if people could drive to the speed limit safely or deposit their litter in a bin then the cameras wouldnt be necessary. Sadly, the only thing that will stop or make some of these people think twice is the threat or reality of being caught and its costing them something for a change rather than selfishly thinking someone else will pay or sort it out. I wish there were was no need of CCTV but, sadly, some of the people we share the streets and roads with make it necessary. I hope that calls by Michael Gove for industry experts and campaigners to submit evidence about the live export of animals is not just another Tory sound-bite. EU rules currently prevent the UK banning exports of livestock but plainly after Brexit that is something we would be free to do. It is estimated that 20,000 live sheep were exported last year to Europe and like many I think that is 20,000 too many. We have some of the highest animal welfare standards in the world but putting live sheep in transporters for slaughter or fattening hundreds or thousands of miles away is not good enough. 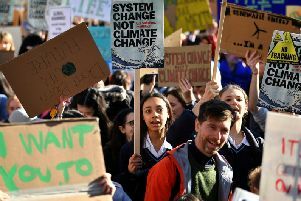 The environment secretary is said to be considering a ban but all other options will also be up for discussion, but a firm stand needs to be taken over this issue. I suppose there will be some people who will diligently load up their cars with empty plastic bottles (washed, of course) and lug them to their local supermarket in the hope of getting a tuppenny ha’penny voucher in return. In the real world, most of us will simply go on dumping used plastic in the bins which most councils already provide for recycling purposes. As a local OAP I’m grateful to David Morris MP for pointing out that I will be receiving an extra £190 in State Pension this year. Some of us, not wishing to be a future burden on relatives or on the state in our old age, have tried to make savings from income during our working lives. The tax allowance of dividend income arising from investments has been reduced on April 6, 2018 from £5,000 to £2,000, the difference being charged at 7.5pc or £225. Nice one Dave.